Beautiful quality Aqua Aura DT pendulum, set in a 925 sterling silver collar mount, on a 925 sterling silver figaro chain and finished with an Aqua Aura 'topper' bead. It has another 6mm genuine Aqua Aura bead set midway in the chain. This super crystal is a 6-sided Generator point. 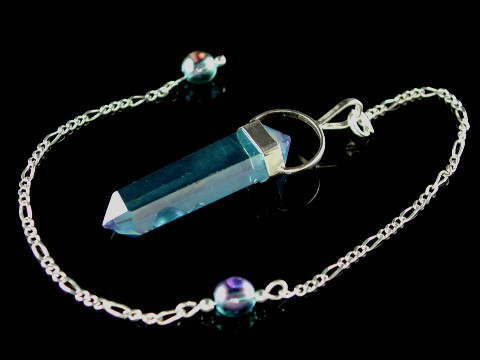 Although Aqua Aura is now readily available, pendulums are seldom seen. Aqua Aura is Clear Quartz coated with a 1 micron film of pure gold, which gives it its distinctive electric peacock blue colour. Aqua Aura is an outstanding tool for people wishing to increase their psychic skills and awareness. It assists with meditation, telepathy, and psychic healing by intensifing the energy generated. It is particularly helpful for distance healing because of its ability to send energy. It can enhance communications of all kinds. It can also assist in conscious awareness of one's own motivations and patterns. It is also used for protection from psychic attacks. To read more about the properties of Double Terminated and Generator crystals, click on the 'Quartz Formations' button (under the 'Info & Articles' section) in the sidebar, on the left hand side of any page.